Charles A. Taylor, widely known farmer of Boone county, died at 5:15 p.m., Thursday at this residence five miles northwest of Lebanon. Heart disease was the cause of his death. He had been ill since last Christmas. Mr. Taylor was a life long resident of Boone county. He was born October 30, 1853 in Sugar Creek township. He grew to manhood on the farm and received a common school education in Sugar Creek township, later attending the Thorntown Academy. Early in his youth he took up farming for a life work and had followed it ever since. For the past forty-seven years he has resided on a farm in Center township. Mr. Taylor was married April 17, 1878 to Maggie Kern, who survives with six children: Lee Taylor and Mrs. Helen Glendenning of Lebanon; Mrs. L. J. Beck and Orville Taylor of near Lebanon; O. G. Taylor, of Yosemite, California and Lawrence Taylor of Long Beach, Calif. One son, Olin Taylor, died in 1925. Surviving are also eleven grandchildren and three brothers, Henry of Thorntown, Armond of Brownsburg and Warner Taylor of Glendale, Calif.
Mr. Taylor was a member of the Presbyterian church of Lebanon. He was formerly identified with all worthwhile movements for Boone county's advancement and was one of the county's most highly respected citizens. The funeral will be held from the residence northwest of Lebanon at 2:00 p. m. Saturday. Interment will be in Oak Hill cemetery. NOTE: This obituary newspaper clipping was left behind by a researcher in the Santa Cruz, CA Public Library's Genealogy Room; it is filed in the Genealogy Room's Lost and Found folder. Mrs. Effie Adair Taylor, Veedersburg, died Wednesday at 12:20 p.m. in the St. Elizabeth Hospital in Danville where she had been a patient eight days. Born near Steam Corner Oct 29 1881, she was the daughter of Solomon and Emerine Underwood Booe. Veedersburg, with whom she made her home and two daughters, Mrs. Lydia Rhodes and Mrs. Ocie Briner of Veedersburg, a brother, Boss Booe, 5 grandchildren and 8 great grandchildren. Friends may call at the Fishero Funeral Home after 7:00 Thursday evening. Services will be held there Saturday January 30 at 1:30 p.m. with the Rev. Wamsley and Rev. Buskirk officiating. Burial will be in the Thorntown Cemetery. John T. Taylor, aged 70 years and 26 days, died at four o’clock Sunday afternoon, at his home in Rosston, after an illness of two weeks, with heart disease. The funeral was from the Rosston Church at one o’clock Tuesday afternoon, conducted by the Rev. C. E. Beery. Burial was at Little Eagle Cemetery. Mr. Taylor was a son of John T. and Catherine Taylor, and was born in Ross County, Ohio, January 29, 1853. He was never married. There are surviving two brothers, Fred Taylor, of Rosston and Alonzo Taylor, of near Horton. He was a member of the Masonic, Red men, and Haymakers lodges at Rosston, and the Pocahontas at Indianapolis. Mr. Taylor was engaged in the mercantile business at Rosston for over thirty years, and was a well-known and respected citizen. Thorntown July 2 -- Mrs. Lydia Margaret TAYLOR well known resident of this community, passed away at her home two miles south of Thorntown at one o’clock this morning following a long illness. Mrs. Taylor became ill in Feb and her condition was aggravated recently when she sustained a fractured arm. Mrs. Taylor was 81 and was born in Putnam Co daughter of James and Sarah Moss. On March 8, 1874, she was united in marriage with Tipton Taylor. She was a member of the Fillmore Christian Church. There surviving are the husband; a son, Lanis and a daughter, Mrs. Cordelia Scudder of Chicago. A grandson, Kenneth; two brothers, James and William Moss of Lebanon and a sister, Mrs. Edward Stark of Seattle also survive. The funeral service will be held Monday afternoon at the home at 2 o’clock with Rev. McDaniel of Advance in charge. Burial will be in Taylor Cemetery near Bainbridge. Stricken suddenly Saturday evening with a heart attack, Mrs. Margaret A. Taylor, age 80 years, passed away at 1:10 o’clock Sunday morning at her home, 215 North West Street. She apparently was in her usual health Saturday and her death was unexpected. Mrs. Taylor was born in Boone County, a daughter of Arthur and Amanda (Beck) Kern, and she spent her entire life here. She resided on a farm five miles northwest of Lebanon until the fall of 1927, when she moved to the city. She was married April 17, 1878, in this county, to Charles A. Taylor, who passed away June 9, 1927. She was a member of the Presbyterian Church. Survivors are six children, Lee Taylor, Orville Taylor, Mrs. Mable Beck and Mrs. Helen Glendenning of Lebanon, Oliver G. Taylor of Chevy Chase, Md., superintendent of the United States National Park system and Lawrence Taylor of Corte Medera, California, and nine grandchildren. One son, Olen R. Taylor is deceased. Funeral services will be held at four o’clock this afternoon at the Bratton Brothers Funeral Home, with the Rev. James D. Martin, pastor of the Presbyterian Church, officiating. Burial will be in Oak Hill Cemetery. Died at Phoenix, Arizona, where he had been residing since leaving Boone county 17 years ago, Sunday night, following an operation he had undergone last Monday for appendicitis. He left this county 17 years ago, going to Phoenix, Arizona, where he engaged in business. He was married to Miss Elma Baldwin, in Phoenix, who with a five months' old son, Charles Russell, survives. He also leaves his parents, Mr. and Mrs. Charles Taylor, or near Hazelrigg; four brothers, Lee Taylor, of Lebanon; O. G. Taylor of Yosemite, Calif.; Orville Taylor, or near Zionsville, and Lawrence Taylor, of Long Beach, Calif., and two sisters, Mrs. L. J. Beck and Mrs. David Glendenning, of Lebanon. Orville Taylor, 49, passed away at home. Played with 1911 school basketball champions. Survived by widow, two children, two sisters, & three brothers. Lebanon, April 20 – Cyrus THISTLEWAITE, a prominent Boone Co farmer living ½ mile east of Big Springs, shot himself this morning about 4 o’clock. Mr. Thistlewaite had been despondent and disposed to worry over the condition of his clover crop and for the past 3 weeks was not himself. He arose this morning, presumably a few minutes before 4 o’clock, and went to the kitchen of his home. He then shot himself in the right temple, death instantaneous. His wife soon reached his side and then the 3 sons who lived at home. Deceased was about 52. He is survived by his wife and six sons, 3 of whom are married. They are: Arda, living in Marion Glen of Oak Park, Ill; Rolla of Bakers Corner and Maverill, Orville and Lowell at home. No funeral arrangements have been made. Cleveland THOMPSON was born 28th July 1884, and died 26th April 1902, aged 17 years, 8 months and 28 days. After an illness of only nine days he passed from this life to meet his mother, who preceded him two years ago to that home beyond the skies. He was a loving, kind and obedient boy and was loved by all who knew him. Since the death of his mother he has made his home with his uncle, George SHAW, and only a few days before his death he looked up at his aunt and said, "I have no home now but I soon will have". This should assure the sorrowing ones that he is now in a happy home and they should not mourn as those who have no hope. Cleave, as he was usually called, attended the public school at Jamestown the past year and was one of ten of successful students to graduate. At the commencement exercises his chair will be draped in mourning. He will be greatly missed by his schoolmates and all others who knew him. The funeral was preached at Mt. ZION Sunday afternoon at 2:30 o'clock by Rev. LEDBETTER, of Swayzee, and his remains were laid to rest in the cemetery near the church. He leaves a father, one sister, two brothers and a host of other dear relatives and friends to mourn his loss. Mrs. Mollie THOMPSON, 76, passed away at the home of her niece, Mrs. John Henry at Thorntown, Thursday morning at 6:10 o’clock, following an illness of 4 days’ duration. She had been in poor health the past year from heart trouble but her condition did not become serious until Monday. Mrs. Thompson was born in Shelby County. She had made her home with the niece, Mrs. Henry in Thorntown for the past 10 years. Surviving are a son, Lettie Thompson of Frankfort; two nieces, Mrs. Henry and Mrs. Charles Himes of Lebanon and one nephew, Frank Miller of Manson. Nathan G. THOMPSON was born in Botetourt County, Virginia, 16 December 1839 and died of heart and stomach troubles at his home in New Ross, 10 January 1906, aged 66 years and 24 days. He was married to Sarah GRAYBILL in the year 1859. To this union were born six children, three sons and three daughters, only one of whom survive, Hugh D. THOMPSON. His wife, Sarah departed this life 8 June 1876. On 22 May 1877 he was again married to Martha E. FISHBACK. To them was born one child, a daughter who died in infancy. He united with the Missionary Baptist church in 1854 and in the fall of 1860 united with the Dunkard church. In October 1892 he took membership with the Christian church at New Ross. He leaves a wife, one son, six grandchildren, three sisters and two brothers to mourn his departure. Funeral services were held at the house on Friday at 10:30 conducted by Eld. Hendrick. Interment at the Inlow cemetery. We wish to thank our many kind neighbors and friends for their assistance and for their sympathy shown us during the illness of our husband and father. The death of Mrs. Margaret HEWITT THORNBERRY who for more than 30 years lived in Thorntown occurred Thursday morning at 6:30 at the home of her stepson, J. W. Milligan, Clarks Hill. She was 95 years 1 month and 7 days old. For more than 30 years she lived in Thorntown with Miss Frankie Burnham residing with her but about 10 years ago she was stricken with paralysis and was then taken to Clarks Hill where she lived with Milligan. She has been in feeble condition many years. Deceased was much beloved by Thorntown residents by whom she was familiarly called Grandma. She was a life member of the Thorntown Christian Church. The funeral services will be conducted Saturday morning at Clarks Hill 10 a.m. by Rev. Kuhn. Interment at Clarks Hill Cemetery. Margaret Hewitt was born in Ross Co OH Feb 20, 1820 and about 1828 came with her parents to Clarks Hill where they entered land. 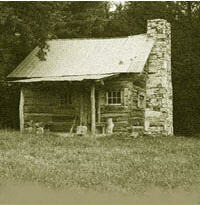 Five white men and a few Indians built a small cabin home for them near Clarks Hill. Later the family moved to Montgomery County and in 1836 the Hewitt's resided in Southern Illinois where the father passed away. When about 20, Mary Hewitt married James Kirkwood who died. She was twice married after, the second marriage to Sam Milligan and 3rd to James Thornberry. Both Mr. Milligan and Mr. Thornberry died, the latter in 1879. No children were born to the 3 unions but the deceased reared a large family of stepchildren most of whom are now dead. Surviving are: J. W. Milligan of Kansas, John Thorn Milligan of Clarks Hill; Will Milligan of KS; John Thornberry of Thorntown and Mrs. Jane Slayback of E. Elm Street, this city. One stepson, Theopolis Milligan died last Sunday at his home in KS. Mrs. J.C. Males of Thorntown is a step granddaughter and W. A. Milligan, undertaker at Clarks Hill is a step grandson. remainder of his life, holding the old “patent” to the land, signed by Andrew Jackson. passed on before him eight years ago, after a journey of fifty-two years with her husband. Repository: Lebanon Public Library, Lebanon, Indiana. Advance, Sept. 23.-- Ira Otto Threlkeld, 56, life-long resident of Jefferson and Jackson townships, Boone county, died at her [sic] home near Golliday school house at 10:20 a. m. today. His death was caused by a complication of diseases. He had been ill three years. Mr. Threlked was the son of John H. and Rebecca Threlked. He married Stella Cogle, who survives. Surviving, in addition to the widow, are eight children, Everett Threlkeld, New Ross; Earl Threlkeld, near Advance; Roy Threlked and Mrs. Ruth Hutchens, both of Pennsylvania; Mrs. Laura Swank, Crawfordsville; Mrs. Ruby Isenhower, Lebanon, and Miss Helen Threlked, and John Edward Threlkeld, both at home; two brothers, Alva Threlked and Lonsie Threlkeld, both of Linnsburg, and eleven grandchildren. Funeral services will be held at 2:30 o’clock Sunday afternoon at the family residence with Rev. Cornelius Airhart officiating. Burial will be in Pisgah Cemetery. Repository: Crawfordsville District Public Library, Crawfordsville, Indiana. Notes from Submitter: "Correct first name, from other records, was “Ora,” not Ira. He was commonly known, however, as Otto. The correct surname spelling is Threlkeld, not Threlked. Also, the usual spelling of the given name of one brother was “Lonie,” not Lonsie." TIERNEY -- Thomas, of Lebanon, Ind., died Nov. 2, aged 32 years. Funeral Wednesday, Nov. 6, at Finn Bros.' undertaking parlors, 125 West Market, at 8:30, followed by services at St. John's Church at 9 o'clock. Burial Holy Cross Cemetery. Thorntown – Arthur Edward TINKHAM, 69, a resident of Thorntown since 1885, died at his home here Friday night at 9:45 following an illness of 3 weeks. Heart trouble caused his death. Mr. Tinkham was born Aug 31, 1862 at Mt. Pleasant, Ohio a son of William and Emma C. Tinkham. On June 12, 1884 he was married to Miss Anna Foulke of Marion, Ill.. During his life Mr. Tinkham resided at Richmond, Westfield, Anderson, New London, Salem and Paoli. He moved to Indiana with his family when he was 2. He attended the Southern Indiana Normal school of which his father was president and later taught school 2 years. He then learned the printing trade and was engaged in newspaper work for many years. Mr. Tinkham is survived by four children: Mrs. Emma A. Hill, Colfax; John Herbert Tinkham Cleveland, Oh; Mrs. Grace E. Furnas, Ft. Wayne and Walter F. Tinkham, LaPorte; William another son died in 1900 at age 5. Funeral service will be held at the home here but the time has not been announced. The rites will be in charge of Rev. C. B. McKee, pastor of the Sugar Plains Church here of which the deceased was a life-long member. Interment will take place at Westfield cemetery. After an illness of two weeks' duration, James R. Tolen, age 73 years, passed away at his home, 1222 South Meridian street, Monday night at 11:30 o'clock from a complication of diseases. Mr. Tolen was born in Hendricks county, the son of Jesse and Nancy (McDaniel) Tolen. He had been a resident of Lebanon about forty years, coming here from Nebraska where he had resided for a few years. He was twice married, the first marriage taking place on August 30, 1879 to Sarah B. Cook, who died October 13, 1900. His second marriage occurred April 4, 1904 in Lebanon to Lida J. Smiley, who survives. Mr. Tolen was a member of the First Baptist Church. Surviving are seven children, George Tolen, Mrs. Alice Harter and Mrs. May Lucas of Lafayette, Cash Tolen of Indianapolis, Mrs. Clara Smith, Albert Tolen and Ferrel Tolen of Lebanon, and one step-daughter, Mrs. W. F. Shirley of Blountsville. Funeral services will be held at the residence, 1222 South Meridian street, Thursday morning at ten o'clock with the Rev. C. A. Dietz officiating. Burial will be at Mts. Run Cemetery. Jesse Tolen, aged a little over 67 years, died Friday at 11:30 p.m. at the home of his daughter, Mrs. Elmore Martin on west Green street. He had been ill a year with chronic bronchitis. The deceased was a native of Hendricks county, this state, having been born there May 13, 1837. He was twice married, the first time to Nancy McDaniel, who died December 24, 1857 and the second time to Mary A. Nelson, who died January 30, 1898. He leaves two children, James Tolen and Mrs. Elmore Martin; one brother, T. M. Tolen, of Beaver Crossing, Nebraska, and one sister, Lucinda Renfrow, of Lizton, Hendricks county. He was a member of the Baptist church. Funeral services and interment occurred at Poplar Grove, Sunday at 11 a.m.
Elmer C. TONEY 66 died at 10 Saturday night at his home, 125 E. Spring Street. His death was attributed to a complication of diseases. Mr. Toney was born Jan 30, 1871 near Jamestown. The deceased who for many years was engaged in the transfer business here, is survived by 3 brothers, Ed of Danville, Il and Joe & Carl Toney both of this city. Funeral services will be held at 2 o'clock Tuesday afternoon at the Utterback & Murphy Funeral home with Rev. CC Fruth of 1st United Brethren Church in charge. Burial will be in Oak Hill. Burial in the Coatsville Cemetery followed services this morning at the Kingsway Christian Church near Avon, for former Boone County resident John D. Trout of Pittsboro. The Rev. John Caldwell officiated for the services in charge of the David A. Hall Mortuary of Pittsboro. Trout, who was 54, died unexpectedly Wednesday of a heart attack at the Hendricks County Memorial Hospital in Danville. Trout was born in Jasper County, Texas, July 13, 1935, he was the son of Millard N. and Elizabeth (Harrison) Trout. A Pittsboro resident 21 years, Trout had lived in Brownsburg and Coatesville. He was a computer operator for Indianapolis Life Insurance for several years. He was a member of Kingsway Christian Church. Surviving are his wife, the former Rilla M. Hybarger; a son, Darin S. Trout, Homestead Air Force Base, Florida; a brother, Rodney Trout, Coatesville; and sisters, Patsy Vaughn of Bell Union, Carolyn Trout, Greencastle, and Kathy Graves, Danville. James H. TOUTMAN, one of Lebanon's best-known citizens died Monday evening as the results of paralytic stroke. He was a native of Kentucky and was 79 years old. He was three times married. The first time to Mary B. TODD, second time to Margaret SUTTON, and the last time to Elizabeth WHITT. He served in the civil war in the 87th Ind. Vol. Funeral services were held Wednesday morning at the late residence. Burial at Poplar Grove cemetery. Note from County Coordinator 8/2006: "I do not know whether there was a typographical transcriber error, or whether the obituary actually spelled the name "Toutman." The obituary file on this website had it filed as "Troutman" and "Toutman" and I do not know which spelling is correct." Note: I am posting this obituary for others. I am not related to the subject. No other information was given. Jesse Troutman, age 63 years, former state officer of the Mexican Border Patrol Veterans organization and also at one time a national officer of that group, passed away this morning at 10:15 o’clock at the Witham hospital. He had been in failing health the past two years and entered the Methodist hospital, Indianapolis on July 24, returning to his home here a few days before entering the Witham hospital on September 4th. He was born in Boone County, the son of Jacob F. and Ida A. (Smith) Troutman. His father, who preceded him in death, was born in Kentucky, and his mother who survives, was a native of Indiana. He served in the National Guard and was with the U.S. forces which patrolled the Mexican border during the Pancho Villa insurrection in Mexico in 1916. Later he was active in the organization of men who served on the border patrol and was elected as a state officer, later serving as an officer in the national organization. At the time of his death he was flagman for the Big Four railroad at the West Pearl and South West streets crossing. Prior to that he was a detective for the railroad and about fifteen years ago served as deputy sheriff at Terre Haute. By profession he was a carpenter and also had been employed by the Dairy Cream Separator Company and Standard Parts Company. Most of his life was spent in Lebanon and Boone County. He was a member of Milledgeville. Funeral services will be held Sunday afternoon at two o’clock at the Harold B. Lawler funeral home, where friends may call. The W. E. McGinnis will conduct the services. Arrangements are incomplete for the place of burial. Note From Contributor: "Jesse Troutman was once married to Mabelle (Cornelius) Troutman. They divorced in 1932. Jesse Troutman is buried in Oak Hill Cemetery, Lebanon, Indiana, next to his mother." John W. Troutman died Monday morning at 2 o'clock, at the home of his nephew, Richard Miller. The deceased was born in Lancastershire county, PA. 6 August 1817. Was married to Elizabeth MILLER in 1837. The union was not blessed with any children, but, he took and raised to manhood Richard MILLER, Peter MILLER (now dead) and Levi WILHELM (now residing in Kansas) He moved to Missouri from Pennsylvania in 1838, and returned to Indiana in about the year 1850 and settled in Boone County, where he plied the trade of blacksmithing for several years. When the civil war broke out he enlisted in the 40th Indiana. Volunteers and served four years, losing a lower limb in the service. After his discharge he located in Jamestown, (Boone County) Indiana and served as a postmaster, after which he took up the shoemaker trade, and after a time discarded that and went into the furniture business with J. T. BARHOP. After a career in that business he sold out to D. C. SMITH, after which he was connected in no business nor followed any occupation. His wife died in December 1898, since which time he made his home with Richard MILLER and wife until death called him home. So passed away another old pioneer of Jamestown. Short services were held at the late home Tuesday at 2 o'clock p.m. after which the remains were interred in the I.O.O.F. Cemetery. Mrs. Mabelle Troutman, aged 50 years, passed away at the City hospital, Indianapolis, Friday morning at 3:30 o'clock. Mrs. Troutman was a daughter of the late Mr. and Mrs. Wesley Cornelius who resided west of Advance. She had resided in Indianapolis for the last twenty years and was a member of the Third Christian church there and the Order of Eastern Star at Terre Haute. She is survived by a sister, Mrs. Ruby Riner of Wisconsin. Funeral services will be held at the residence, 1910 Broadway, Indianapolis, Sunday afternoon at two o'clock with the Rev. M. Rothenberger officiating. Burial will be at New Ross. Friends may call at the Bratton Brothers funeral home until 8:30 o'clock when the body will be returned to the residence in Indianapolis for services. NOTE: Mabelle Troutman died November 10, 1939. Permelia F. Smith Turpin, daughter of Aaron and Frances Smith was born at the old Smith homestead, one-half mile south of Fayette, Boone County, May 28, 1840, died February 17, 1908, age 67 years, 8 months and 20 days. She was united in marriage to Harvey Turpin September 5th, 1867. To this union were born six children: Rachel F. Funkhouser, Mary Ellen Funkhouser, Ola M. Everett, Flora E. Haughan, Harry E. and Homer E. Turpin. four of whom are living. Harry E. died February 6th 1899; Mary E. Funkhouser died December 25, 1901. The deceased united with the Mt. Tabor Regular Baptist church about forty years ago and was one of its most faithful members, having borne its burdens and sorrows with patience and faith, sharing in its joys and prosperity all these years. Words would fail to express the good traits that was manifest in Sister Turpin. She will be greatly missed not only in the church, but among her neighbors and friends, but especially with her family, who were greatly attached to each other and she was happiest when she was surrounded with her children and grandchildren. She leaves one brother, Presley T. Smith, husband, four children, eighteen grandchildren and a host of relatives and friends to mourn her loss. Yet we are not to weep after those that have hope as those that have none, " For a woman that feareth the Lord she shall be praised." We are sure that we have not the language to speak the praise that is due this sister and mother in Israel. To know her was to love her because of her friendliness and socialbility[sic] which always accompanied her. It has been the privilege of the writer to often visit her home, both before and after her sickness. She was always cheerful even to the last except about twenty-four hours in which she was unconscious. Her death was caused by stomach trouble and she bore her affliction with great patience. The funeral was conducted by the writer at the Mr. Tabor Baptist church of Fayette, Wednesday at 11 o'clock a.m. Interment at Mt Tabor Cemetery. TYSER- At the residence of his uncle, in Lafayette, on 17 inst., Oscar TYSER, of Thorntown. Henry C. Ulen, 91, millionaire construction contractor and philanthropist who rarely disclosed his donations to charity, died early today in his home in the Lebanon suburb of Ulen. Ulen, a lawyer, began building his own construction company as a young man while employed as counsel for a Chicago building firm. The company operated from offices in New York for several years, but Ulen wanted to return to his home town of Lebanon and moved Ulen & Co. here in 1929. He built the town of Ulen just north of Lebanon for 25 of his executives and their families. Major projects completed by his company include the Shandaken Tunnel, bored through 18 miles of mountains to double the water supply of New York City, and $11 million aqueduct system in Athens, Greece, and a railroad across the Persian desert. He donated Ulen Country Club, which adjoins his estate, to the city of Lebanon. Funeral services and burial will be in Lebanon Monday morning. VANALLEN -- Harry P., beloved husband of Etta VanAllen and father of Ralph H. VanAllen, departed this life Sunday, Oct. 7, 7:25 a.m., age 54 years. Age 61, died at her home in Clinton township December 31. Born in Shelby Co. Ky. Feb 25, 1863 and is survived by her father Shelby HERROD and stepmother who live in Oklahoma City, Okla., her husband, Gilgord E. VANARSDALE to whom she was married at New Mayesville, Putnam Co. April 5, 1883 and five children, Mrs. Avie COLE, Indianapolis, Mrs. Virgie TOLLEY and Mrs. Fern ATKINSON, both of this city. Mrs. Blanche B. GEORGE at home and Paul L., Fountain, Ohio. One half sister, Mrs. Vonnie LATTELL of Oklahoma City, one daughter, Mrs. Clara L. ISENHOUR is deceased. She had been a resident of Boone County [Indiana] since her marriage and was a member of Christian Church at Mechanicsburg. James L. VAN NOTE was born 18 June 1842, at Cambridge City, Indiana. He died at St. Louis, Missouri, 26 December 1901, aged 59 years, 6 months, and 8 days. He spent the larger part of his boyhood in eastern Indiana where he received his education in common schools. At about the age of 16 he lived in this community [Boone County] with his parents from 1856 to 1860. About this time he moved to La Porte County, Indiana. Being fired with the feeling of intense patriotism and love for his country, he enlisted in Troop E, fourth, Indiana, Calvary, the 7 day of August 1862. He fought bravely in many battles and was taken prisoner at Chickamauga, was confined for a little time at Libby Prison, then at Belle Isle, and fourteen months at Andersonville, at which place he contracted diseases of which he never recovered. At the close of the war he was honorably discharged the 13 day of June 1865. He engaged in the grocery business at the close of the war. He was united in marriage to Miss. Maude A. CLASSER, 11 August 1868. To this union two children survive, Harry L. (married) and Carlos W., with his wife to mourn the loss of a devoted loving father and husband. He also leaves one brother in Danville, Indiana, and one sister in St. Louis. He and his wife united in the Christian Church and were immersed together the same evening. This was November 1869. They have ever lived consistent Christian lives. In the spring of 1870 they moved on a farm east of Jamestown, Indiana where he farmed successfully until 1876. He then moved to Chetopa, Kansas, where he extensively engaged in the live stock business. He built a fine house which was destroyed by fire, 31 January 1885. That same year he moved to Saint Louis, Missouri. Where during the last eight years he has been connected with the Burlington railway. In the spring of 1901 he moved to a suburban home, five miles south east of Indianapolis, expecting to pass the remainder of his life in his native state. His health failing him, he was advised to return to Saint Louis which he did last October. Mr. VAN NOTE was a man of some marked characteristics. He was a genial companion, having an unlimited supply of anecdotes, and an inimitable way of telling them. He was a man easily approached, making friends of all he met. He was a kindly, generous, charitable man, his generosity knowing no bounds. It was a delight to his life to make other people happy. He was an optimist, no pessimism in his soul. In his business adventures he was usually successful. He did business as a rule, on a strictly a cash basis. His devotion to his family was sublime, leaving them in very comfortable circumstances. A life insurance of between $3,000 and $6,000 attests to the wisdom and his foresight. Mr. VAN NOTE was a life long friend and bosom companion to J. W. HENDRICKS. This brave patriot, and kind , Christian man has gone to the reward of the just. With our tears and love we crown. Of Heavens radiant victor bands"
A very distressing accident took place at the home of Joseph VEACH, in north west part of Jamestown, last Saturday morning by the scalding to death of his little daughter Hazel, who was not quite four years old. Mrs. VEACH was preparing to do washing and had prepared a tub of scalding hot water on a chair, when the little one stepped up to it while she was away and tipped it on to itself, scalding it most awfully in the face and over the front of the body so severely that it died Sunday morning from effects. The father and mother have the heart-felt sympathy of all. Edwin David Vidito, 86, who had spent his entire life in Boone County and was affectionately called the Mayor of Dover, passed away Tuesday afternoon at Witham hospital where he was admitted Monday. Born in Boone County January 26, 1878, he was the son of Lewis Jasper and Emma (Heckathorne) Vidito. His first marriage was to Anna Sherrill and his second marriage was in Lebanon to Una Hiland, who died eight years ago. Surviving are two daughters, Mrs. Bernice Watson of Lebanon, and Mrs. Leveda Threlkeld of Dover; two sons, Earl of Dover and Jewell Vidito of Brownsburg; 14 grandchildren; and 32 great-grandchildren. One daughter, Ruth Clark, preceded him in death. Funeral services will be held at 2 p.m. Friday in Old Union church with the Rev. Herbert Swearingen and Rev. Homer Hunsinger officiating. Burial will be in Old Union cemetery. Friends may call at the Russell and Hitch Funeral Home in Lebanon after 7 p.m. today until 11 a.m. Friday when the body will be taken to the church to lie in state. Edwin Jasper Vidito; a well known farmer residing six miles south of Lebanon, died at 7a.m. Wednesday, August 6, 1902, after six days illness. Apoplexy was the cause of death. Mr. Vidito was a native of Ohio, having been born and raised in Ashtabula county April 23, 1822. On June 6, 1844, he was married to Elizabeth Demeese [sic] in this county. of the seven children born to this union only four survive him. They are: George C., Sarah R. Shirley, wife of Wm. Shirley; Lewis J. and Harvey T. Mr. Vidito leaves nine grand children and six great grand children. He is survived by one brother, Leonard C. Vidito. The funeral was held at 10:30 a.m. today at the Methodist Protestant church of Milledgeville of which he was a member. The services were conducted by Rev. Boxwell. Interment at Old Union. Elizabeth Vidito widow of Edwin J Vidito, born April 20, 1826, died at her home in Harrison township, aged 80 years. She was united in marriage to Edwin J. Vidito, now deceased June 6, 1844. To this union were born eight children, four of whom have proceded[sic] father and mother to the heavenly life. The surviving children George E Vidito of Kansas: Rebecca R. Shirley, Louise J. and Harvey T Vidito of this county. The last three, mentioned were at the mother's bedside during her last hours. The deceased joined the Methodist church at Milledgeville as a charter member March 3, 1861. She is he last surviving charter member of that class and we trust that she has gone to joint those that have proceded [sic] her to that heavenly land. Those who know her best recognized her as a faithful and devoted Christian. She also leaves one brother, William Deweese and a sister, Sarah Powell in Missouri, six grand children, eleven great grandchildren. Emily Jane Vidito was born in Mercer County Ky., Nov. 20, 1822; died at 5:15 PM Nov. 13, 1904, at her residence in Center Township, Boone County, Indiana, aged 81 years, 11 months and 23 days, after a illness of three years . The deceased was married to Leonard Chauncey Vidito, in Hendricks county, this state, Nov. 2, 1848 and was the mother of the following surviving children: Sarah Dale, John R. Vidito, Martha Copeland, Margaret Powell, Phillip J. and Vernelia Vidito. Two brothers, George and Richard Cox, and three sisters, Fannie Owens, Mary Johnson and Mickie Pruitt, survive. Mrs Vidito was a charter member of the Methodist Protestant Church at Milledgeville, the second person to sign the articles of association. The funeral was conducted from Stewarts Chapel at 11 AM Tuesday, by Rev. Frank Dougherty, of Jamestown. Burial at Old Union. Mrs Vidito was born Feb 24 1918 in Catlin, Ill. to Virgil And Kathryn Ann (Glade) Buckingham. She married Earl Vidito on June 17, 1936. He died May 27, 1995. She moved with her family to North Salem at the age of 2 and graduated from North Salem High School 1936. Mrs Vidito moved to Lebanon in the early 1940s, where she was a waitress at Wheeler's Resturant. She also worked at Scott's 5 & 10 and spent a period as a homemaker, before she and her husband began farming in Western Boone County. After 11 years of farming, the couple built the Homestead Inn at Dover and operated the restaurant until 1974. The had moved to Thorntown and she was employed eight years at Home National Bank until retiring in 1983. The couple had wintered a number of years in Bonita Springs, FL. Hobbies including reading, flower gardening and sewing. She was a member of the Dover Christian Church, PSI Upsilon Sorority in Thorntown and was formerly in the Order of Eastern Star at Thorntown. Survivors include two sons, David Lee Vidito of Chester, Va., and Phil Vidito of Indianapolis, a daughter, Mrs. Robert (Sue Ann) Scott of Thorntown; two sisters, Dorothy Jones of Saxton, Mo., and Norma Trent of Advance; two brothers, Wayne Buckingham of Thorntown and Harold Buckingham of Mechanicsburg; eight grandchildren, Scott Vidito of Radoforn Va., Lisa (Vidito)Elswick of Chesterfield, Va., Jeff, of Thorntown, Kasha (Scott) Smith of Thorntown, Nocloe and Nathan Vidito of Indianapolis; and seven grest-children,[transcriber errors?] Jeremy Vidito, Zachary, Nicolas , Cortney, John, IlaSue[transcriber error?] and Levi Scott. A brother, William Buckingham preceded her in Death. Services will be at 10:30 a.m. Thursday at Myers Chapel, 1502 N, Lebanon St Lebanon . The Rev Raymond Duff will officiate with internment at Old Union Cemetery. Mrs. Una Vidito, 65, a life long resident of Boone County, died early this morning, Dec.7, 1955 following a long illness. Mrs. Vidito made her home near Dover and was a member of Old Union church. She had a host of friends throughout out the county. She was born Feb. 19, 1890, the daughter of Marcus T. Hiland and Phoebe Ann (Nortchutt) Hiland, and on April 30, 1914 was married in Lebanon to Edwin D. Vidito who survives. Surviving also are two daughters, Bernice Watson of this city; Mrs. Leveda Threlkeld of Dover; two sons Earl of Dover and Jewell Vidito of Brownsburg; a brother Roy Hiland, Lebanon; one sister Arlie Jett, Lebanon; and 12 grandchildren and 7 great-grandchildren. Funeral services will be conducted Friday at the Old Union church with burial following in the cemetery there. Friends will be received at the Walker funereal home in Jamestown. ELIZABETH F. VIELEY died in Lizton at the home of her daughter, Mary E. LEACHMAN, Saturday, 27 October at the age of eighty years and eleven days. She was the oldest daughter of Wm. and Eliza LEAK. At the age of seven years she, with her parents, moved from Kentucky to a farm near Lizton where Lizton now stands. Her entire life was spent in this community. The country then was almost unbroken forest. She has pleased her children and grandchildren with her many stories and thrilling experiences of her early days in the wilderness. Later when the town of Lizton was laid out it was named in honor of her. At the age of fifteen she was married to Jesse VIELEY. To this union were born seven children two of whom still survive her -- Mary E. LEACHMAN of Lizton and Anna R. ADAMS of Indianapolis. She also leaves one sister, Mrs. Sarah J. HILL of Indianapolis. For twenty-seven years she was a lonely widow. Twenty-two years ago she began making her home with her two daughters and each have tried to excel the other in their kindness to her. It was always a pleasure to them to do something for “mother.” When she came into the home she brought sunshine and happiness with her. At the age of twenty years she became a member of the Christian church, through out her life she was a sincere chris - christian [sic] showing her faith in her daily walk and conversation. In the presence of her family, in her acts of charity, in the constant submission to the will of her creator, in her returning good for evil, in her faith, her virtue and patience. In all of which she abounded, she gave constant evidence of the faith within her. Let us hope that this noble character will be as a bright star to guide us all in her pathways. Funeral services were held at the Lizton Christian church by Rev. L. L. CARPENTER. Interment in VIELEY cemetery. Mrs. Frances R. Voorhis, 70 years, 1 month and 18 days old, died at 10:30 o'clock last night at the home of Mr. and Mrs. Joseph Perkins, three miles southwest of Lebanon. Death was due to a complication of diseases. She had been ill for several years. Mrs. Voorhis was a native of Shenandoah County, Va., being born February 3,1848. She came to Indiana with her parents when she was a child and has lived since that time in the neighbohood where she died. She was married in this county on January 2,1867 to Joseph T. Voorhis, who died December 14,1875. Three children survive: Charles Voorhis, Anna Dye and Mrs. Laura Perkins. Two daughters are deceased. There are three half sisters, Mrs. Ezra Slater and Mrs. Etta Wilson, of Lebanon, and Mrs. Axie Harrison of Whitestown, and one step-sister, Mrs. Hattie Cogswell of Indianapolis. Mrs. Voorhis was a member of the Methodist Church at Gosset's Chapel. The funeral will be conducted from the residence of Ward at 10 a.m. Friday by the Rev. Mr. Ward, of Whitestown. Burial will be in Oak Hill Cemetery here. Submitter Note: "Frances was the daughter of Payton Lutz and Susannah Painter. Her mother died in Shenandoah County, Va., and she and her father came on to Ohio where he met and married Margaret E. Anderson. And they all came to Boone County before 1860." Rebecca Ann OXLEY was born 1 October 1849 and died 29 August (1905). She lived 55 years, 10 months, and 28 days. She was married to Elias WAINSCOT, April 27, 1868. To this union were born four children: Nettie S. CANADA, Robert H., Orville and Carl WAINSCOT, all of whom are living. One brother and three sisters- Jas OXLEY, Mattie OXLEY, Jennie FRUITS and Lide STONEBREAKER still survive her. She joined the First Christian church and was baptized by Elder BANNAN. Throughout the long period of sickness that characterizes tuberculosis of the lungs she remained the most patient and sweet disposition person that it has been one’s lot to meet. She goes to join her husband who died Dec. 4, 1903. The funeral was held at the Shiloh Christian church at Advance Thursday at 10 a.m. Burial at Jamestown. Orville WAINSCOTT, 52, of 714 Spann Avenue was injured fatally and two other persons were hurt, neither of them seriously when two automobiles collided at the intersection of Lover’s Lane and Lebanon Road at the east edge of the city, shortly before six o’clock Friday night. Wainscott sustained a broken neck, a punctured lung and internal injuries when the automobile he was driving collided with a car operated by Bernard McCollum of the Smartsburg vicinity. The local man died a few minutes after arriving at Culver Hospital where he had been taken in a Proffitt & Sons Ambulance. Riding with Wainscott was his son-in-law, Herschell Pickett of this city. Pickett was bruised and cut and went to his home here after receiving treatment and being examined at the hospital. McCollum is in the hospital with cuts and bruises. He was severely cut about the right side of his head. The crash occurred when the Wainscott car, going south on Lover’s Lane met the McCollum machine, headed west on the Lebanon Road at the intersection. McCollum was enroute to work at RR Donnelley. Wainscott and his son-in-law were on their way to their home when the crash occurred. Wainscott had been husking corn at the Robert Clark farm NE of the city and Pickett had been doing similar work at the PH Croy farm. Pickett said that he did not see the McCollum car until an instant before the crash occurred. McCollum made a like statement. When the ambulance arrived at the scene the machines were on the south side of the Lebanon road just a little west of the intersection. Both Wainscott & Pickett were thrown clear of the intersection and although McCollum could not accurately recollect it is presumed he also was tossed out of his car by the force of the impact. Both men were driving light sedans. Orville Wainscott was born on Aug 20, 1880, near Dover, the son of Elias and Rebecca Wainscott. He was married to Albertus Shackley Nov 18, 1903. He was a member of the Old Union Church near Jamestown. The deceased has been a resident of this city for 22 years, 21 of which were spent in the employee of the Mid-States Steel & Wire Company. He operated a filling station north of the city on state road 43 last summer. Surviving are the widow; two children, Mrs. Eulia Pickett and Avanella, of this city, one sister, Mrs. Nettie Canada of Putnamville, two brothers, Robert of Winfield, Kansas and Carl of Scircleville and two grandchildren. One son, Emmons passed away when he was 5. Funeral services will be held on Monday afternoon at 2 at the Proffitt & Sons Funeral Home in charge of Rev. WW Roberts; burial in Jamestown Cemetery. Thomas J. WALDRON 50 years a resident of Lebanon died in that city Monday night of pneumonia and complications. Mr. Waldron was born in Norfolk, VA Aug 28, 1828 and was therefore 87 and six months old when death called him to rest. In 1856 he was united in marriage to the late Harriet Smith who died 9 years ago. From this union 4 children, Sylvester Waldron of Indianapolis; Mrs. William Groves of this city; Samuel Waldron of this city and Thomas Waldron Jr. were born. Thomas Jr. died several years ago. 9 grandchildren and two great grandchildren survive. Funeral services for Mrs. Dorothy Walker 25 years old, wife of Olin J. Walker Jr., who died at Culver Hospital in Crawfordsville Sunday morning, will be held at the Salem Methodist Episcopal Church near Zionsville, Tuesday afternoon at 2:30 o'clock. Mrs. Walker's death was attributed to septicemia following a Cesarean section operation at the hospital last Tuesday. Her baby lived twenty-four hours. Mr. and Mrs. Walker lived on a farm near Zionsville several years, but recently resided in Boone County, Indiana. Mrs. Walker was a graduate of Zionsville High School. Besides her husband she leaves a son, David, and a daughter, Martha Jane, and her father Clark Jennings, and stepmother of Zionsville and two sisters. Francis M. Wall, died at his home near Barnard 12 April 1909. He was born in Putnam County, 79 years and six months ago, moving to Boone County in 1834. He was married to Casander Lasley, to which union were born four children: Nancy HEDGE of Nebraska, James Wall and Martha Gordon of Roachdale, Indiana, and Joseph who died when two years old. Mrs. Wall died in 1890. In 1900 Mr. Wall, married Mrs. Mary Neal, who still survives but is in critical condition from paralysis. The following brothers and sisters survive: Mr. Wall, Mrs. Nancy Whitecotton and R. N. Wall of Advance, Clara Hostetter, Foss, Oklahoma; Roddie Weddie, Vaneta, Oaklahoma; together with a half brother, Edwin Wall of Southwest City, Mo. He was a member of the Baptist Church. Mr. William WARWICK, who lived on John M. SWELLEY's farm, about one mile west of Ward, died Sunday night. He leaves a wife and two small children. He was a member of the K. of P. order of which body took charge of the funeral arrangements. Burial took place at the Old Union Cemetery forenoon. His age was a little over 30 years. William T. WASSON, 85, died Saturday afternoon at the county farm, where he was taken some months ago. He had been ill the past year. Short services were held by the members of the POS of A in the undertaking parlors of PF Harwood Monday morning at 8:30 and the body was then taken to Thorntown on the NW traction line. Funeral services and burial were conducted at that place. Mr. Wasson was born in Adams Co OH Nov 23, 1827. His wife died in March 1907 and since that time he has been living alone most of the time. He was a member of the local, camp POS of A. Two daughters, Mrs. Samuel S. Kepler of this city and Mrs. George Hummell of Cleveland Ohio survive. Bernice E. Vidito Watson, 97, Lebanon. died Oct. 2. She was a clerk for Mitchell and Berry Drug Store, Lebanon, for 14 years, retiring in 1976; Mrs. Watson was a member of the First Community Church, Lebanon, and the American Legion Auxiliary. Memorial contributions may be made to the Church. Graveside services: 10 AM, Oct 5. in Oak Hill Cemetery, Lebanon with calling from 9:30 AM. She was proceeded in death by her husband Earl Davis Watson and her son John D Watson. Survivors: brother, Earl D Vidito, Jewel M Vidito, sister Leveda Threkeld:, five grandchildren, two great grandchildren. Myers Mortuary, Lebanon is handling the arrangements. Jamestown, Oct 7 – - Mrs. James WEAVER died at the Robert Long Hospital in Indianapolis Thursday night as the result of accidentally drinking a lye solution at her home north of here Sept 15. Mrs. Weaver was born in Fountain County Nov 26, 1869, daughter of Mr. and Mrs. Anaris Powell. She was married to James Weaver, Sept 7, 1886. The deceased was a member of the Old Union Church. Surviving are the husband: 3 daughters, Mrs. Pearl Layton of near Lebanon; Mrs. Walter Johnson and Mrs. William Huddleston of near Jamestown; one brother, Columbus Powell of Hillsboro & 10 grandchildren. Funeral services will be held at the Old Union Church Sunday afternoon at 2 o’clock with Rev. Kibbey near Advance as officiating minister. 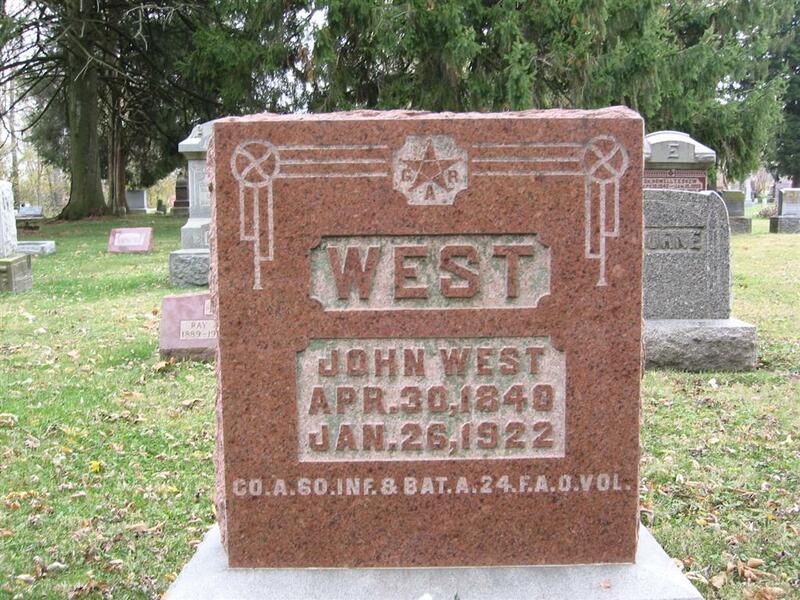 John West was born in Fayette county, PA., April 30, 1840. During that year he was taken with his parents to Highland county, Ohio, where he grew to manhood. He enlisted in 60th Ohio Volunteer company A, a one-year company in 1861. In 1863 he enlisted as a private in company A, 24th Battery Regiment of Light Artillery of Ohio Volunteers and was enrolled on the 30th day of April 1863, to serve three years or to the close of the war. He was discharged from the service of the United States on the 24th day of Jun, 1865, at Camp Denison, Ohio. In March, 1869, he was married to Sarah E. Foote of Warren county Ohio. To them were born three children, two sons and one daughter, Edward, Amos and Lillie all of whom survive him. In 1876 Mr. West moved with his family to Boone county, Indiana, settling in the vicinity northeast of Zionsville, where he lived until his death Jan 26, 1922, aged 81 years, 9 months and 26 days. On September 16, 1902, he was married to Ella Thompson. To this union was born two children. The first died in infancy and the second Ruby Pearl survives. His life was exemplary; he was held in high esteem by his neighbors, among whom he lived for almost half a century. His last illness was of some years duration, but during all these years of affliction he bore his suffering without complaint or murmur, submitting willingly to the will of Him who doeth all things well. He was an affectionate husband and loving father and grandfather, making sacrifices that his family might have fullest share of the blessings of this life. He leaves a wife, two sons and two daughters, eight grand children to mourn this loss. The neighbors join in sympathy in this the hour of affliction. Funeral services were held at the Eagle Creek Christian church Saturday morning, January 28th, conducted by Rev. C. H. DaVoe of Zionsville. Interment was made at Eagle Creek Cemetery. Mrs. Mary Jane West, aged 70 years, 4 months and 7 days, was found dead in bed Tuesday morning at her home, 518 North Clark street. Mrs. West had been in failing health for the past six months and for two weeks had been bedfast. Monday, however, she seemed to be feeling better than usual. Her daughter, Mrs. Anna McClain, of Danville, who was here attending her bedside, slept with her Monday night. When Mrs. McClain awoke Tuesday morning she found her mother dead. The end had come peacefully some time during the night, and was probably due to an attack of heart trouble growing out of the disease with which she had been afflicted. Mrs. West was a native of Kentucky, where she was born August 22, 1829. Her last husband, William West, whom she married in Lebanon in 1872, died in 1888. The surviving children are Benjamin P. Martin, of Frankfort, and Mrs. Anna McClain, of Danville. Mrs. West was a member of the Baptist church of this city. Funeral services were held at the late residence this morning at 10 o'clock, followed by interment at Brockway cemetery. Note: Corrections to obituary; Mary's last husband was Willis West, not William. The date of their marriage is incorrect. It should be, February 23, 1871. She was previously married to William Francis Martin, James Chenoweth and George H. Johnson. Albert WETHERALD, 83, prominent Boone county farmer died at his home northwest of Thorntown Wednesday morning at 6 o'clock. Death came after an extended illness and was due to heart trouble. The deceased was born on a farm adjoining the one on which he died Oct 13, 1847, the son of Joseph and Elizabeth Bulla Weatherald. He was married more than 50 years ago. Mr. Wetherald was a member of the Wesleyan Church of Thorntown. He had spent his entire life as a farmer, most of the time on the farm where he resided at the time of his death. Survivors are the widow and 5 children: Charles of Logansport; Blaine of Indianapolis; James at home; Mrs. Carrie Sample of Indianapolis and Mrs. Gertrude Carson of South Bend. Two other children preceded him in death. A sister, Mrs. Emma Norris of Thorntown and a number of grandchildren survive. The funeral services have not been announced. -PITTSBORO- Mrs. Wilkinson, who was severely burned 24th of March, when her house burned, died Tuesday afternoon at 2 p.m.
Advance, 8 October -- Word was received here Monday of the death of Mrs. Allie Willett, 76, of Turners Station, Kentucky. Miss Edith Canada, Mr. and Mrs. Earl Canada and Mr. and Mrs. George Canada went to the Willett home Saturday for a visit and found out Mrs. Willett had died of a heart attack that morning. Mrs. Willett was a resident of Advance about 30 years ago. She was the daughter of Mr. and Mrs. John Wall. Survivors are Mrs. George Mc Mannis and Mrs. Forest Clogget. Her husband Dennis Willett, preceded her in death. Mary Ann WILLIAMS quietly passed through the gates of death Tuesday morning at 1 o'clock. She was born in Wayne County, 22 November 1822, aged 78 years, 8 months and 18 days. She had been sick since last August. The funeral was preached at the house by Byon [sic] ADKINS Wednesday morning at 10:30 o'clock and the remains were to rest in the Harshbarger Cemetery, north of Ladoga. She leaves an aged sister and brother and many friend [sic] to mourn her. The relatives wish to tender their sincere thanks to their friends who have been so kind and willing to help them in any way during her long illness. Funeral services will be held at 10:30 a.m. Tuesday at the Russell and Hitch funeral home in Lebanon for Mrs. Amy Edith Wills, 79, a Boone County native and former Lebanon and Advance resident, who passed away Saturday morning at the Nursing Home in Crawfordsville. Interment will be in Oak Hill Cemetery. The Rev. Wayne Kivett will be the officiating minister. Mrs. Wills had made her home the past 3 ½ years with a son in Advance before going to the nursing home and had been bed-fast during that time. Prior to that, she lived in Lebanon. She and Mr. Wills were Superintendents of the Boone County Farm for 4 years and formerly farmed south of Lebanon. She was a member of the Methodist Church at Advance and a former member of the Rebekah Lodge. Born August 19, 1889, she was the daughter of John W. & Florence M. (Broshar) Campbell. She was married June 20, 1916, in Crawfordsville, to Nathaniel Wills, who died June 4, 1960. She is survived by the son, Eugene Wills of Advance; a step-son, Earl Wills of near Lebanon; seven grandchildren and 13 great grandchildren. A step-daughter, Mrs. Mary Perkins, is deceased. Friends may call any time at the Russell and Hitch Funeral Home. Merle I. Wills, age 63 years, passed away Saturday afternoon at 12:15 o’clock at the Methodist Hospital, Indianapolis, following a two months illness from a complication of diseases. Mr. Wills was born in Boone County, a son of James and Elizabeth (Gipson) Wills, and he spent his entire life here with the exception of a seven-year residence in Putnam County. He was married in 1900, in Boone County, to Pearl Moore, who survives. He was a member of the Christian Church at Maysville in Putnam County. Besides the widow, he leaves two children, Mrs. Leonard Witt, of Roachdale and Floyd Wills, of Terhune; two brothers, Ed Wills of Orlando, Florida and Hal Wills of near Lebanon; three sisters, Mrs. Lillie Graham of Lebanon, Mrs. Clemmie Snyder of Lebanon and Ethel Beck of Greencastle, and seven grandchildren. A son, Lester Wills; five brothers, Jacob, John, Charles, Jasper and Frank Wills, and a sister, Mary Wills, are deceased. The body is at the residence where friends may call and where funeral services will be held Tuesday morning at 10:30 o’clock with the Rev. W. P. Kibbey officiating. Burial will be in the Hopewell Cemetery. Rufa W. Wilson, 76, a native of Thorntown, died early this morning at the Deer Creek Nursing Home in Deer Creek, following an illness of one year. He had been a carpenter most of his life and has resided in the Thorntown community many years, moving to Lucerne 10 years ago. He was a member of the Presbyterian church at Flora. The son of Joseph and Harriet (Gipson) Wilson, he was married to Laura Snyder, who died March 3, 1953. Survivors include three children, Harriet Wilson, Mrs. Cleo McPherson,[?] both of Flora, and Mrs. Roma Field of Denver, Colo. Two brothers and a sister preceded him in death. Burial at Gipson Cemetery near Thorntown will follow last rites Friday at 10:00 a.m. in the Russell and Hitch funeral home at Thorntown. Rev. William H. Myers of Flora will be the officiating minister. Friends may call at the funeral home beginning Noon Thursday. Lebanon June 4 -- Mrs. Anna l. WINTERS, 63, postmaster at Fayette, Boone County for 7 years and for 29 years a carrier in the rural route mail service in Boone County died late Friday at Methodist Hospital in Indianapolis. She had been in failing health and recently was retired form the mail service on pension. She was the widow of Dr. Willet H. Winters who died 35 years ago. She is survived by a step son, Bert Winters, West Palm Beach Fl; a brother, George Watson. Funeral services will be held Sunday at 2:30 pm. At Powell Memorial Chapel in Oak Hill Cemetery here by the Rev. Carl H. Barnett past of the Central Christian Church of which Mrs. Winters was a member. Note from transcriber: Mrs. Witt was 78 years old, no county in Virginia was given. Note: I am posting obituary for others. I am not related to the subject. No other information was given. Jamestown, Aug 6 –- Lloyd Lasate WOLFENBARGER, a resident of Jamestown for 11 years died at his home here in the north part of town late Thursday afternoon his 45th birthday, following an illness of one year. Tuberculosis caused his death. Mr. Wolfenbarger was born in Washburn, Tenn Aug 5, 1887, son of Pete and Matilda Wolfenbarger. He was never married. He and his mother and two brothers came here 11 years ago where they have since made their home. He was a member of the Baptist Church at Washburn. Mr. Wolfenbarger is survived by his mother, two brothers, Walton and Frank of Jamestown; another brother, Porter of New Maysville and one sister, Mrs. Arthur Lively of Amo. One brother, Dan and his father preceded him in death. Funeral services will be conducted at the home Sunday afternoon at 2:30 and will be in charge of Rev. AL Miller, pastor of the Jamestown Methodist Church. Interment in Jamestown IOOF cemetery. Marie May WOODARD, little daughter of Herschel and Myrtle Woodward, living north of Lizton, was born 9 February 1903, and died 25 March 1904, being 1 year, 1 month and 16 days old. Little Marie leaves a kind father, loving mother, her little brother Clarence, and her dear old grandparents Thompson and Woodard to mourn her loss. Funeral services were conducted Sunday afternoon by Rev. George A. Joseph of Advance, Interment in the Popular Grove cemetery. The mother of L. D. Woodcock, the latter one of the proprietors of Thorntown Enterprise, died at the home of her son in Thorntown last Thursday with consumption and complications of grip. She was 72 years old and leaves a husband, two sons and one daughter. Transcriber Note: "This obituary was a hard one to post. It did not give the subjects name or maiden name. I listed her as Mrs. Woodcock supposing she had been only married once and had the same last name as her son." PHILADELPHIA, Sept. 12 -- Dr. Thomas Woody, Professor of Education at the University of Pennsylvania, died yesterday at his home in suburban Upper Darby after a brief illness. He was 69 years old. Dr. Woody, known for his research and writings in the fields of comparative education and the history of education, had been a member of the Penn faculty for forty-one years. A native of Thorntown, Ind., he was graduated from Indiana University in 1913. He received his master's degree from Columbia University in 1916 and his doctorate in 1918. He was appointed an assistant professor in the School of Education at the University of Pennsylvania in 1919 after serving as a teaching assistant in education at Columbia. He was promoted to full professor in 1924. While associated with Penn, he served at various times as a visiting lecturer at the University of California, Swarthmore College, Johns Hopkins University and the University of Illinois. In 1951, Dr. Woody presented several thousand volumes on the history of education to the main library of the University of Pennsylvania and to the university's Penniman Memorial Library of Education. In 1952, he received the Publications Award of the American Academy of Physical Education. Recently he was selected to receive the University of Pennsylvania School of Education Alumni Society's National Award of Distinction at the university's Schoolman's Week in October. He was a member of the American Historical Association, the National Society of College Teachers of Education, the American Academy of Political and Social Science, the Pennsylvania Historical Society and a number of other organizations. His many published works included "Life and Education in Early Societies," a two-volume "History of Women's Education in the United States," and "Liberal Education for Free Men." Dr. Woody is survived by his widow, Mrs. Wilhelmine Lawton Woody, and two daughters, Mrs. Edward Herman and Mrs. Fred Zeta. Winnemuca, Oct. 4. -- Last rites were held Monday afternoon by the Eddy mortuary for Joseph Woolridge, 93, who died at the local hospital on Sunday afternoon. Known as Tennessee Joe, Woolridge was born in Lebanon, Ind., on March 22, 1852. He came to Humboldt county from California in 1906 to work on ranches in Paradise valley. When he entered the hospital in 1943, he had been employed on the Bradshaw ranch owned by F. B. Stewart. No relatives are known to survive him. David and Sarah are both buried at Little Eagle Creek Cemetery in Hamilton County, Indiana. David T. Wright was born July 6, 1832 and died February 9, 1896. He was born in Tyler County, WV and had been a consistent member of the Christian Church for over thirty five years. Our mother, Sarah J. Wright was born May 28, 1828 and died October 13, 1896 in Burlington, West Virginia. She was married to David T. Wright on September 25, 1859 and they removed to Boone County, Indiana in 1888. As a result of this union six children survive the beloved parents, five boys and one daughter. Our mother joined the Christian Church thirty-two years ago, and has lived a consistent Christian ever since. Yet while our loss has been the greatest possible here on earth, we live reconciled to the fact that there is a hereafter in which we may all join in one sweet accord if we follow the beckonings of father and mother. We, the survivors wish to express our gratitude to our neighbors and friends for their untiring efforts in our behalf during our sickness and trials. Marion Wright and brothers and sister. The flower of love lies bleeding. He died at his mother's home in Boone Co. Ind. Ferdinand Aubry Wright of Osceola, Clarke County, Iowa, in the forty fourth year of his age. Born in Trimble County, Ky Jan., 19, 1834. Died Jan 7th 1878. Blessed are they that mourn for they shall be comforted. Death a sure and grim harvestor [sic] has come and plucked our loved flower and all is desolation. The sunny fruitful gardens of our hearts, thus despoiled of their sweet bloom and beauty are bleak and barren. No more alas, do we hear the tender tones of his loved musical voice. But pure spotless angel bending lovingly and pityingly over him, hear them now. Dear lost uncle. Having won noble daring achievements, the imperishable crown of a gallant soldier, he met the enemy death as bravely and calmly as he ever met a mortal foe. His countenance radiant with the calm glory of the confident happy Christian. Nothing could assure us of this more strongly than his last words. "O, bless Jesus and all his holy angels." When he felt that dread hour, which we all must see sooner or later, was approaching, he called his mother, the fond mother of his childhood, now a patient good woman bent with the weight of eighty one years to his bedside and said, "Mother remember me." Oh, simple yet beautiful word! Yes, dear departed soul, thou mayest be Satisfied and joy in the reflection that she whose heart is sore and bleeding from the unexpected blow of a merciful providence, the only surviving parent, will never forget thee. Aye we are confident that green as the vine that is nourished by the silver dew drop, and the golden sun beam, the sacred image shall ever live in her memory, and in that of all the others that sorrow for thee. John Strother Wright and wife, Charolette (Pendleton) Wright. They were both born in Virginia. His brother's and sister's were: LaFayette Wright and he married Phoebe Farley in Trimble County, Ky: Sarah L. Wright who married John L. Winn also in Trimble County, Ky: Narcissa Wright who married James Miles and I don't know the place of their marriage as I cannot find a record for them: Mary Priscilla Wright, who married Albion A. Farley in Trimble County, Ky: Robert C. Wright who married Isabelle Spohr in Boone County, Indiana: John P. Wright who married Mary Loop in Boone County, Indiana and Geraldine O. Wright who married James Miller in Boone County, Indiana. I have the dates of marriage on all the above but Narcissa Wright and James Miles." Francis Marion Wright, well known farmer, passed away Sunday morning at 4:45 o'clock at the Witham Hospital, where he had been ill with pneumonia for the past five weeks. Mr. Wright was born in Tyler County, WV, and was 73 years old at the time of his death. He was the son of David T. and Sarah (DeNoon, Prickett) Wright. Hoskins of Muncie and a half-sister, Mrs. Doris McIntyre of Oklahoma. One brother is deceased. Mr. Wright was a highly respected citizen of this community and had resided on his farm near Whitestown for 53 years. His wife has been an invalid for the past several years. Funeral services were held at the Little Eagle Church Tuesday afternoon with the Rev. Orville Woody officiating. Burial was in Little Eagle Cemetery. Mrs. Effie Jane Wynkoop, 73 years old, native and life resident of this county, died early this morning at her home one-half mile north of Max after a serious illness of six months. She had been in ill health several years. Born November 23, 1877, Mrs. Wynkoop was the daughter of Emsley and Mary Ann (Owens) Jackson. She was married in November, 1894, to Albert Wynkoop, who died 15 years ago. She was a member of the old United Brethren church at Max. Survivors are a daughter, Mrs. Mary Edna Pittman, Route 4, two brothers, William and Luke Jackson, both of near here, a half-brother, Joe V. Jackson of near Jamestown; two sisters, Mrs. George Evans and Mrs. Arthur Fine, both also of Route 4; two grandchildren; and two great-grandchildren. One brother and three half-brothers are deceased. Services will be held at 3 p.m., Sunday at the Russell and Hitch funeral home. Burial will be in Old Union cemetery. Friends may call at the funeral home after 7 o'clock tonight. Mrs. Dora May YARYAN, 74, of Thorntown died at 3 p.m. Friday May 19 in Witham Hospital, Lebanon where she had been a patient since Sunday. She was a daughter of James and Jenny BURKE FRUITS and was born Jan 13, 1887 in Montgomery County. She married Samuel Yaryan in 1901. He died Oct 11, 1952. Mrs. Yaryan has lived in Thorntown since 1952[?}. Prior to that she lived in Parke County and in the Waveland community for two years in the state of Washington. There are 12 children surviving: Mrs. Paul Poole; Mrs. Damon Copas of Thorntown; Mrs. Stanley Covault, Darlington; Mrs. Albert Paugh, Huntington; Mrs. Dale Springer, Waynetown; Mrs. Carl McAfee of Indianapolis and Mrs. John Terry; Mrs. Powers Coomers and Mrs. Tom Rubintino, all of Renton, Washington. The three sons are Lee & Charles Yaryan of Indianapolis and Max Yaryan of Lebanon. Also surviving are 37 grandchildren, 12 greats and a half-brother, Fred Lightcap of Lafayette. Two brothers, two sisters and several grandchildren are deceased. Funeral services were held Monday at Russell & Hitch Funeral Home, with Rev. Bob Anderson and Rev. John Simpson officiating. Burial in Maple Ridge Cemetery, Waveland. On Thursday, 29 December, death removed from our midst our dearly beloved sister, Mrs. L. A. Lowry-Yelton. She had been afflicted with dropsy for several months and her heart had become afflicted. She did not rise Thursday morning, saying she felt worse. Between 1 and 2 p.m. she yielded up the spirit. She was born in Rush county, Indiana, 22 January 1851, removing to Hendricks county, Indiana, with her parents, Mr. and Mrs. John H. Lowry, in January 1856. She united in marriage with John B. Yelton on 27 November 1867. Nine children survive her, of whom the two oldest daughters are married. A more patient, loving or truer mother never existed than she, and tho' she had many trials in her life, she bore them with remarkable patience, trusting in the Lord, that all would be well in the end. In time of sickness she was unexcelled and has been known to make self sacrifices for those whom she though two be more needy than herself. She united with the Christian Church when she was very young and lived a true Christian life. She leaves countless numbers of friends and many relatives to mourn her departure. The funeral took place at the Christian Church at 2 p.m. Saturday, after which the remains were interred at the old family grave yard, southeast of town. We desire to express our most sincere thanks to the good, generous hearted people of Jamestown and vicinity who so kindly and willingly lent their loving assistance to us during the sickness and death of our beloved mother. - - John Yelton and Family. Isaac YOUNG, 92, a resident of Montgomery County for more than 50 years, died at the county farm Friday morning at 2 o’clock following a short illness. Mr. Young had been in failing health for the past quite some time but was not confined to his bed until a few days ago when he suffered a stroke of paralysis. Infirmities of old age coupled with the stroke caused his death. Mr. Young was born in Boone County but lived here the greater part of his life. In his younger years when he was able to work he was engaged in the building of roads. Only a few distant relatives survive him. Funeral services will be held Sunday afternoon at 2 o’clock at the Hunt & Ratcliff Funeral Home here and will be in charge of Rev. E. A. Arthur, pastor of the Memorial Presbyterian Church. Interment in Oak Hill Cemetery. WAR VETERAN, 72 YEARS OLD, SUCCUMBED TO LIVER ATTACK SUNDAY MORNING. Funeral Services Will be at the Mechanicsburg Methodist Church Thursday. John Young, 72 years old, a farmer, died at 3 o'clock Sunday morning at his home, a quarter mile north of Mechanicsburg. Cancer of the liver caused death. An operation at Indianapolis hospital was attempted a week ago. After an incision had been made, attending doctors said surgery was inadvisable in view of his condition. Mr. Young was brought home Saturday. Funeral services were held from the Methodist Episcopal church at Mechanicsburg Thursday. Mr. Young was born in Marion county, this state, August 25, 1843. The decedent was twice married, his first marriage being to Miss Nancy Saicher [sic], Dec. 24, 1865. Seven children were born to that union, of which three are living, as follows: Dr. Edward Young, Sheridan; W. W. Young, Cashmerr, Wash., and Mrs. Pearl Mustin, two miles west of Mechanicsburg. The second marriage was Oct. 8, 1884, to Miss Lyda Salee, and ten children were born, of which six are living as follows: James, Lebanon; Charles, Frankfort; Benjamin, Electa, Retha and Andrew, all at home. A half brother, James Finney, of Indianapolis, and a half sister, Mrs. James Resh, of Rensselaer, also survive. Member of G. A. R.
The decedent was a member of the M. E. church and of Rich Mountain Post No. 42, G. A. R., of this city. He also served during the civil war, being a member of Company G in the 116th Indiana Infantry. The hour of the funeral is indefinite because of the uncertain arrival of W. W. Young, a son from Cashmerr, Wash. The family requests that there be no flowers. Note: "This obituary is of my great great grandfather, John H. Young. He was born Aug 25, 1843 in Marion County, Indiana and died Mar 21, 1915 in Mechanicsburg, IN, Boone County. He was the son of Abijah and Mary Roberts Young. His first wife in this obit is actually Nancy Fancher and not Nancy Saicher as is listed." Tipton: Marion B. Young, 54, former resident of Montgomery County, died at Tipton Memorial Hospital at 9:30 p.m. Monday, an hour after he was stricken with a heart attack. Mr. Young moved to Tipton in 1943 and operated the Tipton Tractor and Supply Co., until 1953, when it was destroyed by fire. Prior to that he was employed by the U. S. Department of Agriculture. Earlier in his life, he had been a farmer in the Shannondale neighborhood for a number of years. Born Dec. 7, 1900, in Boone County, he was the son of W. Lee and Nellie Burroughs Young. He was married June 1925, at Ladoga to Nina Stanley. he was a member of the Tipton Presbyterian Church and of the Elks Lodge at Tipton. He graduated from Crawfordsville High School and later attended Wabash College and Purdue University. The survivors include his wife: the mother who lived at her son's home; four children, Mrs. Malcolm Canada of near Thorntown, Mrs.. Richard Jaguar of Newcastle, Stanley, a student a Indiana University, and Don, at home, and three grandchildren. His father proceeded him in death. Funeral services will be held at 2 p.m. Thursday at the Russell & Hitch Funeral Home in Lebanon. Rev. John Beans of Tipton will be in charge, with burial Shannondale Cemetery. Friends may call at the funeral home. Submitter Notes: "Nellie Burroughs was the daughter of Martin and Malinda Jane Rutledge Burroughs, of Montgomery and Boone Counties, Indiana. W. Lee Young was the son of John Van Nice and Elizabeth Ann Caldwell Young, of Boone County, Indiana." Mrs. Nellie B. Young, 90, of Tipton died at 9:30 a.m. Sunday at American Nursing Home at Kokomo. Born in Boone County July 25 1878, she was the daughter of Martin Burroughs and Malinda Jane Rutledge. She married W. Lee Young Aug 29, 1899. Mrs. Young had lived with her son and daughter-in-law in Tipton since 1947. She had previously been a resident of Shannondale where she and her husband had farmed. She was a member of Bethel Presbyterian Church in Shannondale. Surviving are four grandchildren; Mrs. Malcolm Canada of near Jamestown, Mrs. Richard Jaeger of Lafayette, Stanley Young of Tipton, and Don Young of Torrance, Calif., and nine great-grandchildren. Mr. Young, three sisters and one brother preceded her in death. A son Marion B. Young, died in 1955. Funeral rites are scheduled for Tuesday at Russell & Hitch Funeral Home in Lebanon with Rev. William E. Thompson officiating. Burial will be in Shannondale Cemetery. Friends may call at the funeral home. Notes from submitter: "Mrs. Malcolm Canada is Betty Louise Young and Mrs. Richard Jaeger is Leanna Gene Young. Both are the daughters of Marion B. and Nina Stanley Young. W.
Lee Young was the son of John Van Nice and Elizabeth Ann Caldwell Young." Thorntown - Otuis U. Young, 83, a former trustee and assessor of Jefferson Township, died Friday at 3:30 p.m. at his home on RFD2, Thorntown, a half-mile west of Dover. He had been in poor health for three years and serious for eight days. A lifelong farmer, Mr. Young was also a member of the advisory board when the present Dover School was built. He was a democrat. At the time of his death he had lived 52 years on the same farm. He was a member of the Dover Christian Church and the Knights of Pythias at Shannondale. A native of Boone County, Mr. Young was born Nov. 14, 1868, the son of George T. and Catherine Burroughs Young. He married, twice, first to Elizada Sanford, about 60 years ago. She died in 1919. On March 7, 1925, he was married to Della Grimes, who survives. Other survivors include two sons, Riel A. Young, RFD 4. Lebanon and W. Wayne Young, RFD 1, Thorntown; a daughter, Mrs. Nellie G. Wilcox, Lebanon; two step-daughters, Mrs. Mildred Emmet, Indianapolis, and Mrs. Frieda Garner, RFD 2, Thorntown; a step-son DeVon Stottler, at home; two sisters, Mrs. A. L. Loop, Crawfordsville, and Miss Nora B. Young, St. Petersburg, Fla.; 11 grandchildren and nine great-grandchildren. He was preceded in death by an infant child, three sisters, and a granddaughter. Funeral services will be conducted at the Dover Christian Church Monday at 2 p.m. Burial will be in the Shannondale Cemetery. friends may pay their respects at the residence from 6 p.m. Sunday until noon Monday. Notes from submitter: "Otis U. Young was Otis Uriel Young. Catherine Burroughs Young was Margaret Catherine Burroughs, daughter of Uriel & Leanna Bramblett Burroughs. Mrs. A. L. Loop was Betty Louise Young. A. L. Loop was Dr. Aubrey L. Loop. Deceased granddaughter was Judith Ann Loop." The ten year old child of Mr. And Mrs. YOUNGER, who died at their home in Indianapolis, Sunday, was brought here Tuesday and buried in the I.O.O.F. Cemetery. Forest, little son of Mr. And Mrs. John YOUNGER, aged 1 year , six days, died Tuesday night at 8:30, of cholera infantum. The remains were interred in the I.O.O.F. Cemetery, Wednesday at 3 o'clock. Clora Jackson Zimmerman, 84 Lebanon, died April 20,2005, Services: 11a.m. Sat., April 23 at Russell & Hitch Funeral Home, Lebanon, Fri. April 22, 2005. Mary E., wife of Wm. H. ZIMMERMAN, died at her home west of Jamestown Monday morning. Funeral services were conducted at the home Monday afternoon by Rev. Chas. Jakes. Attended by many sorrowing friends, after which the remains were interred in the I.O.O.F. cemetery north of Jamestown, attended by many friends and neighbors. James M. ZION, 82, twice candidate for governor and long known as Indiana’s Apple King succumbed to heart trouble at 8 o’clock Friday morning at the home of a daughter, Mrs. Hunter H. LEAMING of this city. He became widely known through his political and apple growing activities. Ever since the sudden death of his wife in 1919, followed by financial reverses, he had lived in retirement. He clung to his home here in which vicinity he had lived 40 years but spent much of his time in the Leaming home. Mr. Zion, the last of 9 children was a son of William and Amelia Sims Zion, and was born in Lebanon Sept 22, 1848. His early education was obtained in the Lebanon Academy, where he was a classmate of the late James Mount, who later became governor, the two were lifetime friends. On Oct 5, 1870, he was married to Melvina Loveless of Clark’s Hill to which union 5 children were born. During the first 23 years of his married life, Mr. Zion was a successful solicitor for the Appleton Publishing Company which work brought him into contact with governors, senators, lawyers, educators and other leaders in every state of the union. Much of his time was spent in the west, where he traveled by stagecoach. For 14 years the family resided in San Francisco. Wide travel brought to him a deep appreciation of Indiana apples and in 1892 he acquired a large farm in Tippecanoe County near Clarks Hill. He thereupon became Indiana’s pioneer commercial orchardist. By 1904, his orchard had become famous, particularly after the world’s fair in St. Louis, where he won first prize and a gold medal for the largest apple (18” in circumference), and for the best individual exhibit in the horticultural building. For a number of years thereafter he won hundreds of prizes at state fairs and national and international expositions. The late Kin Hubbard, a close friend, once wrote that “Jim Zion is getting humped shouldered carrying off prizes from the state fair,” the two were close friends and Hubbard each year sent an autographed copy of his “Abe Martin” book to Zion. Many newspaper and magazines carried articles on Zion and his famous orchard. He pioneered in attempting to heat orchards against freezing using oil stoves, but the practice proved too expensive and impractical in other ways. In more recent years, Mr. Zion had manufactured vinegar, which he catered to hotels and fancy groceries. In 1908, Mr. Zion was a candidate for governor on an independent ticket and in 1920 was again a candidate, when McCray & McCullough were the Republican and Democratic nominees, respectfully. He was a liberal in politics, putting principle above party. For 62 years he had been a member of the blue lodge, F & AM of Lebanon and for nearly as long he was affiliated with Lafayette commandery, Knight Templars. Surviving are 3 daughters and two sons, E. R. & Dr. J. R. Zion and Mrs. Joy Barton of San Francisco; Mrs. Joseph Labaree of Julesburg, Colorado and Mrs. Leaming with four grandchildren. Friends who wish to view the remains may call at the Leaming home at any time until the hour of the funeral. Short services for Mr. Zion will be held at the home of Mr. Leaming Monday noon with only the most intimate friends and relatives present. Following this, the remains will be taken to Clarks Hill where services will be held Monday afternoon at 2:30 at the Methodist Episcopal church.